Today is exactly 11 months since my dad passed away which means that the big 1 year anniversary is coming up soon. I wanted to do something to honor him. Something that would keep his memory going. My dad was my favorite person to photograph. His face was wrinkled perfection and his beard was so photogenic. My favorite place to photograph my dad was on the farm. There was just something extra special about those photos. So….I want to give away a session. This isn’t a family session where everyone gets dressed up. I want to photograph your farmer doing what he does best, farm. Whether he is out in the field, working in the shop or roaming around the farm….that’s what I want to capture. If you have a favorite farmer, someone you love more than life itself, then nominate him. I can’t promise he will love you for doing this but I can promise you will love having those photos of him. Your farmer can be retired too and still live on the farm. He does not have to be actively farming right now to be entered. 1. 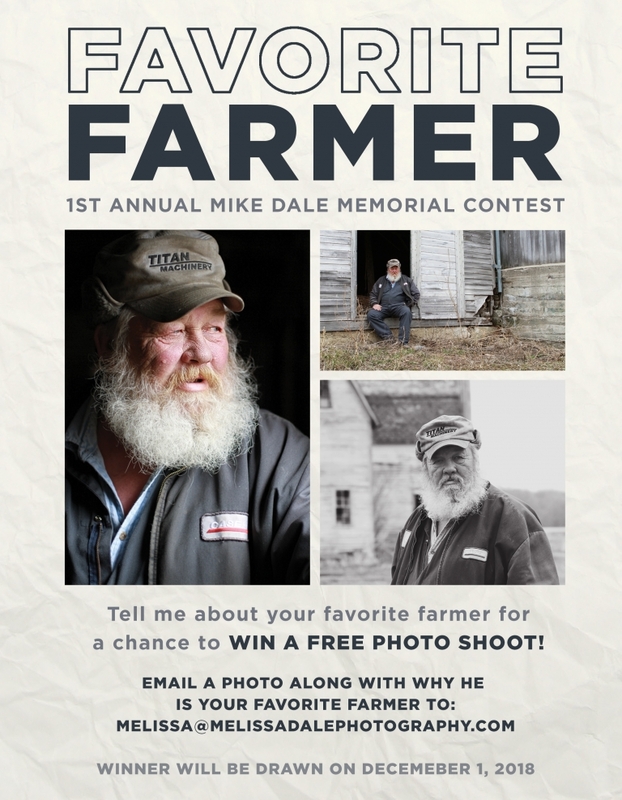 Email a photo and at least a paragraph on who you are nominating and why he is your favorite farmer to melissa@melissadalephotography.com. Make sure to put ‘FAVORITE FARMER’ in the email subject line. 2. Be sure to include where his farm is located in your email. Bonus points if you include a picture of the farm. Winner will be drawn on December 1, 2018! **Actual shoot can take place anytime in 2019.